Sieve the spelt flour into a bowl, dissolve the yeast in a jug with a little of the milky water and make a well in the centre of the flour. Add the yeast and cover the liquid with a sprinkling of flour. Cover the bowl with a cloth and leave in a warm place until the yeast ferments and you can see air bubbles. Add the beaten egg, butter, sugar, currants, sultanas and mixed spice with the remainder of the liquid. Carefully mix all ingredients together and then knead well to form a soft, slack dough, and until smooth and free from stickiness. Divide the mixture into eight equally sized balls. 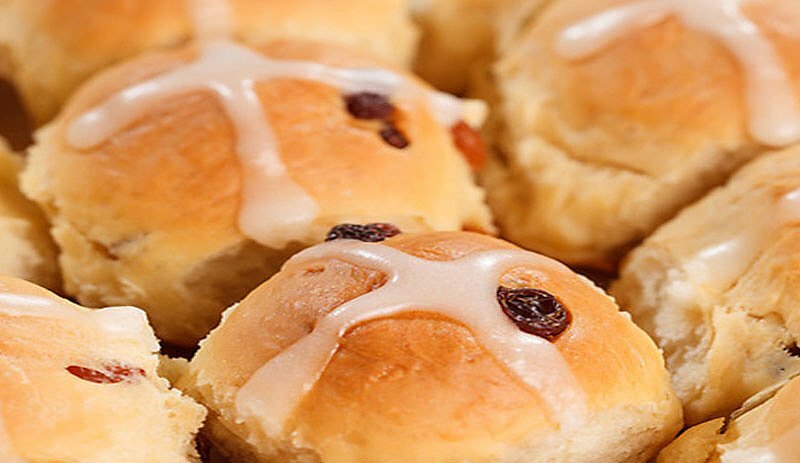 Make a cross on top of each bun with the back of a knife, or make a slack mixture of flour and water and pipe crosses using a greaseproof paper cornet. Cover and allow to prove in a warm place. Bake in a hot oven (Gas 7/220ºc) for approx 15-20 mins.